With "Free Light Japanese" you can learn Japanese writing system (Hiragana, Katakana and 1945 Joyo Kanji), vocabulary (and soon sentences) and pronunciation by using multimedia techniques. It supports 2 modes - teacher's mode and student's mode. Only Free Light Japanese has successfully incorporated the following 3 advanced technologies into the same product. By combining pictures, sounds and texts, your Japanese course will be never a painful activity. You are wasting your precious time by using a paper dictionary. Why don't you let the computer to find kanji you need? You can make your own exercises by importing pictures and texts from any painting programs, scanners or Internet, so your tutorial materials are indefinitely expandable. Click on one of the numbers in a picture to learn how to pronounce and write the items in Japanese. In this screen the numbers are also in Japanese but may be used the classic Arabic numerals too. The size of picture could be fairly large because the program can import ones up to 1024x1024 pixels. Beside Hiragana and Katakana (phonetic letters of Japanese origin), you can learn the most important Kanji characters (ideogram letters of Chinese origin). Each Kanji can be reached by 4 different methods: component, number of strokes, pronunciation and English meaning. It is really a pleasure to see different Kanji to appear immediately by just changing the access methods. In pronunciation access method, can you find instantaneously Kanji by using Romaji (English alphabetic notation). We use Hiragana for Kunyomi (Japanese style pronunciation) and Katakana for Onyomi (Chinese style pronunciation). If you choose access by English meaning, just type an English word and the computer will find Kanji for you. Each Kanji have several pronunciations (2 or 3 for less numerous and up to 10 for more) according to its meaning. You can choose one of the pronunciations by clicking a button of the window. The new version gives English meanings of each Kanji character at the same time. You can learn Hiragana or Katakana by drawing characters with the mouse and it is the computer which will recognize your handwriting. There are 3 levels of difficulty: in easy level, outline and order of tracing are shown, in medium level only outline and in hard level you have no help. In teacher's mode, you can construct your own exercise by adding up to 100 questions per picture. You are importing your own or purchased pictures in the commerce. Add a question by selecting the arrow's direction and then move the item number where you want by just dragging it with the mouse. After constructed an exercise, you can display all the answers in order to control the content. You can also print the exercise and carry out a paper test for your pupils by hiding one of the items: Japanese words, pronunciation or meaning. To open this window, choose at first a question then carry out the command "Record sound" from the menu "Alphabet". You listen the teacher's voice and then record your own in order to compare them (not only by hearing but visually). Only in teacher's mode can you record the voice in the second track - teacher's voice. Long awaited Free Light Japanese version II is now available (for Mac and for Windows). It allows users to have Japanese sentences and questions about them. The CD-Rom includes Free Light Japanese I and II in both Mac and PC formats. Moreover, every registered users will receive free a password to be able to upgrade the older versions via Internet. Please click on Free Light Japanese II to get more information on the product. You can even download a demo version from that page. Windows 2000, XP, Vista or 7, 16 Meg of Ram, 50 Meg of free space in the hard disk and color monitor SVGA or beyond. A sound card is necessary, if you want to hear or record the voice. Mac/OS 7.0 or later (X or later are NOT supported), 4 Meg of Ram and 10 Meg of free space in the hard disk. A microphone is necessary, if you want to record the voice. In order to run Free Light Japanese II, you need a CD-Rom driver and 16 Meg of Ram. DOWNLOAD Windows Demo jsetupd.exe (2643507 bytes bytes). DOWNLOAD Mac Demo fljap15.sit.bin (1200256 octets). Go to the free updating area. You can purchase Free Light Japanese by downloading the program and exercises through Internet. 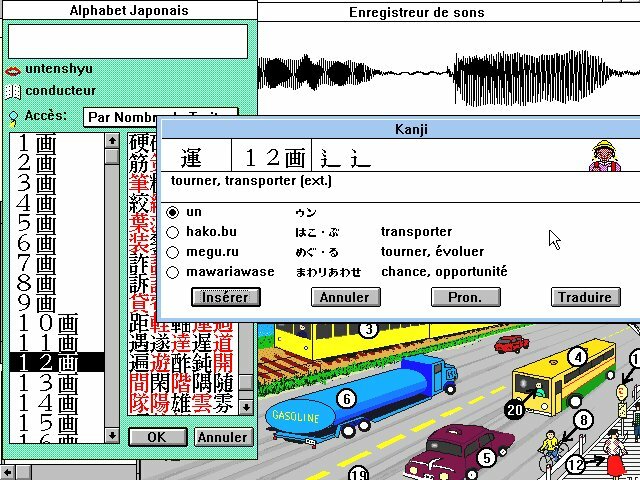 The offer includes Free Light Japanese I and II for both Windows and Macintosh, and costs only 30 US$. In order to purchase it with a credit card, please click on the button below*. *2CheckOut.com Inc. (Ohio, USA) is an authorized retailer for goods and services provided by Free Light Software. If, for some reasons, your credit card will be rejected, please use another card processing server by clicking here.